Published by Martin Giger on March 14, 2015 in News. Closed Tags: beta, community update, copy, Git, libnotify, playlist, progress, queue. After being asked if we are re still alive a few times on twitter, we decided that it is time for another one of our nearly monthly community updates. In addition to a lot of tweaks to the building process from djcj, we’ve also got a patch ready to make the build number helpful again. What this means is that we’ll exactly know what version of Nightingale you have when you report bugs or feature requests. Previously the play queue would only let you copy tracks. Now, thanks to luisgmarine’s work you can move tracks. If you press Control (or your OS’s equivalent of a copy key) you can copy and then paste the tracks. Playlists already showed the cursor for copying tracks when pressing Control on the keyboard, now they actually let you copy tracks in place. 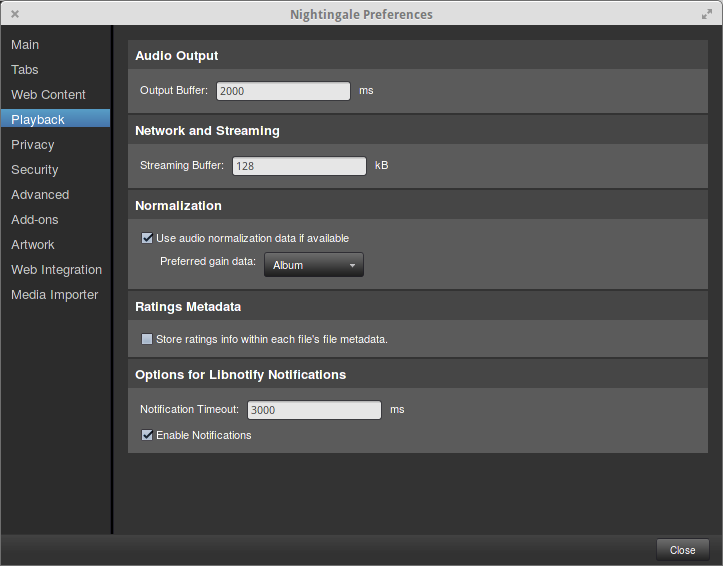 Ever since we added libnotify support to Nightingale we wanted to expose preferences to disable it. 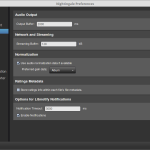 Now they are available in the playback section, if your version of Nightingale is able to show libnotify track change notifications. Lastly, we’re currently discussing moving developer meetings to another day of the week. If you previously couldn’t attend the developer meetings, or if you plan to keep attending them, head over to the poll on the forum. Published by rsjtdrjgfuzkfg on October 12, 2012 in Core and News. 6 Comments Tags: beta, build, nightingale, progress, taglib, windows, xulrunner. A lot of interesting work has been done behind the scenes since the last blog post. Even though we’re still low on developers (are you a dev? we’re still searching! ), ilikenwf and Mook made many steps in the direction of building with a more current, vanilla XULrunner. Non-technically speaking, that means making Nightingale much faster and more reliable, with more addons and support for newer web services. I (rjtdrjgfuzkfg) just finished working on the fix for the only blocker issue we had with 1.11. We finally have working Windows builds using a recent version of taglib (read: builds without the annoying crash issue) and that means that the basic porting for using a newer, vanilla taglib is done. Now we need your support – please download the testing build and try it out to see if everything works as expected. A huge part of the metadata handling code was rewritten, so we need to test it thoroughly. Please report any issues and all the successes you run into in the forums or at the github issue tracker, so we can fix them in preparation for releasing the next version! We will also be working on using system taglib support on Linux, which would reduce the number of bundled dependencies, making Nightingale even more lightweight. Linux builds of the current taglib changes are not yet available due to the required dependency rebuild, but they should be rolling out very soon! Speaking of 1.11.1, we’re moving in the direction of releasing the second and probably last release from the current code branch. There are many bugs fixed already, and we’re looking forward to publishing them in a stable build soon. Again, we need your help testing, so make sure and let us know if you see something that is not ready yet or broken. Thanks for your interest into the Project! License Site content licensed under the GNU GPL.